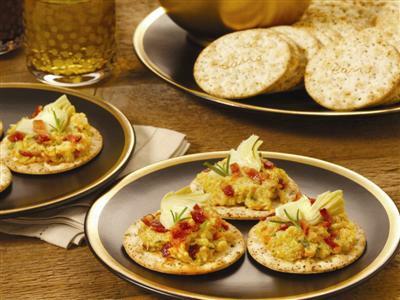 To add an effortless note of elegance to your next get-together, select a special hors d’oeuvre. Chef Bradford Thompson of Lever House in New York City has created some surprisingly simple recipes for a sophisticated party. 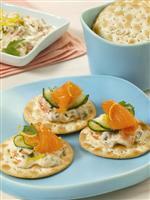 He chose Carr’s(r) Table Water(r) Crackers as the perfect complement to his recipes’ robust flavors. 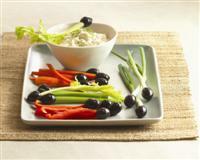 You can also try a new twist on traditional favorites by revving up the relish tray with these new olive recipes from Lindsay Olives(r) – delectable bites and an easy fresh vegetable dip are a delicious part of a fun evening with friends and family. With minimal preparation, each new olive ensemble is sure to impress as a prelude to a dinner party or impromptu gathering. 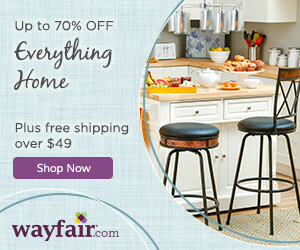 For more sophisticated entertaining recipes and nutritional information, visit www.carrscrackers.com. For more tips and quick olive recipes, visit www.lindsayolives.com. 1. In small bowl whisk together crème fraîche and cream cheese until combined. Add lemon juice. Whisk until light. 2. Stir in parsley, capers, lemon peel and chili powder. 3. Flake salmon. Reserve about 1/4 cup of the flaked salmon. Stir remaining salmon into crème fraîche mixture. Cover and refrigerate until ready to use. 4. Spoon about 2 teaspoons salmon mixture onto each cracker. Garnish with reserved salmon and cucumber slices. 1. Place olives in colander and rinse under cold water. Pat dry with paper towels. 2. In medium bowl, combine goat cheese and cream cheese. Form a rounded teaspoon of cheese mixture into a small ball, and transfer to parchment-lined baking sheet; repeat with remaining cheese mixture, making 24 balls in all. Chill for 30 minutes or until firm. 3. In each ball, make a small indent with your finger. Place an almond-stuffed olive into the indent and mold the cheese around the olive. Roll back into a ball shape with the olive completely encased in the cheese. 4. Place the toasted almonds in a small bowl and roll each ball to coat. Keep the balls, covered, in the refrigerator until ready to serve. Serve cold. The olive balls will keep refrigerated, in an airtight container, for up to 1 day. Note: For a milder more kid-friendly variation, feel free to omit the goat cheese and use all cream cheese. 1. Combine cheddar cheese, cream cheese, sour cream, mayonnaise and garlic in food processor. Pulse several times until ingredients are well incorporated. Add olives and green onions. Pulse until chopped. The dip should be slightly chunky. Transfer to serving bowl or plate. 2. Dip can be garnished with additional chopped green onions. 3. Skewer black olives with vegetables and arrange around the dip. Serve chilled or at room temperature.